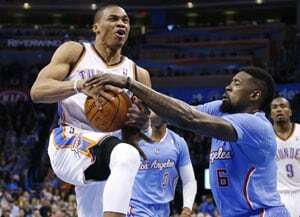 The Los Angeles Clippers showed they are a strong contender for the NBA Western Conference title by winning 125-117 at Conference leader Oklahoma City on Sunday, with Jamal Crawford scoring 36 points. Donatas Motiejunas sank two free throws with 14.1 seconds left to complete the scoring. Dragic scored a career-high 35 points for the Suns, but missed a 3 at the buzzer. Dwight Howard scored 25 for the Rockets, who trailed by 10 entering the fourth quarter. Joakim Noah had 20 points, 15 rebounds and four blocks for Chicago, which had won five in a row. The Bulls shot 36 percent. Portland's Damian Lillard had 32 points to lead the undermanned Trail Blazers to a 108=97 victory over Minnesota, having trailed by 18 points in the first half. Brooklyn signing Jason Collins played his first game with the Nets - becoming the first openly gay player in the four major U.S. professional sports leagues - and contributed to a 108-102 victory over the Los Angeles Lakers.